When I am feeling a bit down, I turn to baking. Much like the character Izzie from Grey’s Anatomy, I found myself baking night after night after night during finals week to relieve myself of mounting stress. The great thing about this is that my problem solves itself: I bake, I share with my friends, and I feel better. 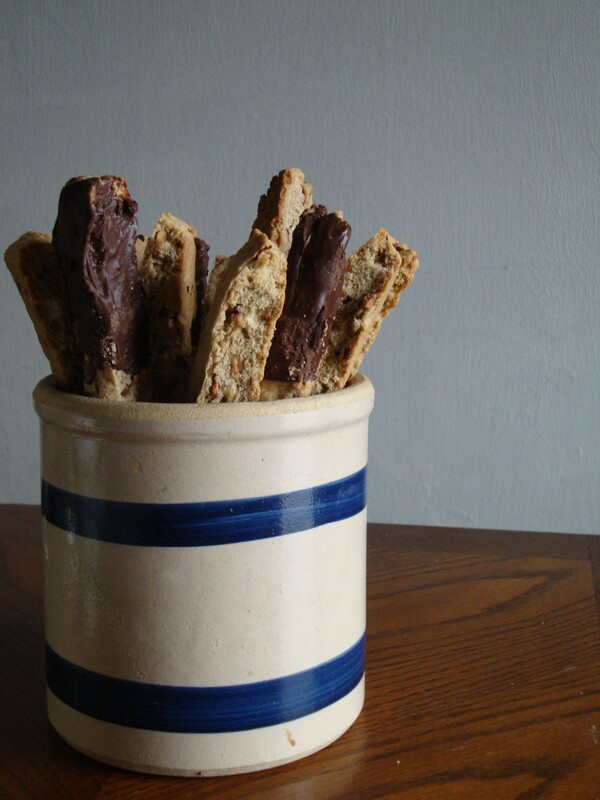 What is more social and more easy to share than biscotti, the twice-baked Italian dry cake? Drinking coffee or tea is an act that lends itself to socializing. 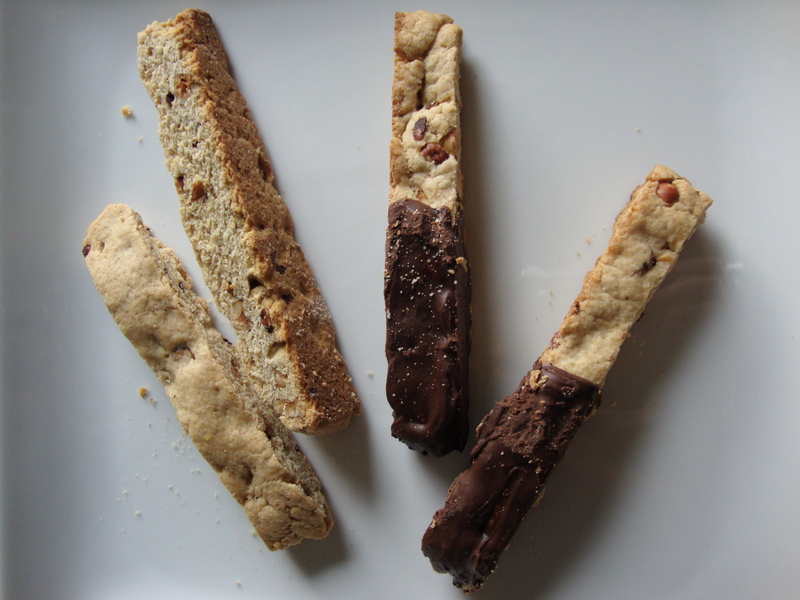 Coffee’s complement, biscotti, was an easy enough excuse for me to use to call up my hard working friends and persuade them to take a study break because I made some hazelnut biscotto (plural), and wouldn’t they like to try it? And while my friends think that I just happened to bake and be so kind enough as to share treats with them, little do they realize, that sometimes, I bake just so I could see them. Heat oven to 350 degrees. Spread hazelnuts in an ungreased shallow pan. Bake uncovered about 10 minutes or in a skillet on medium heat for 5-7 minutes, stirring occasionally, until golden brown; cool. In a large bowl, beat sugar, butter, almond extract (optional), vanilla and eggs with electric mixer on medium speed, or with a spoon. Stir in flour, baking powder and baking soda. Stir in hazelnuts. Place dough on lightly floured surface. Gently knead 2 to 3 minutes or until dough holds together and hazelnuts are evenly distributed. Divide dough in half. On one side of ungreased cookie sheet, shape hald of dough into 10 x 3-inch rectangle, rounding edges slightly. Repeat with remaining dough on the same cookie sheet. Bake about 25 minutes or until center is firm to the touch. Cool on cookie sheet 15 minutes; move to cutting board. Cut each rectangle crosswise into 1/2- inch slices, using sharp knife. Place 20 slices, cut sides down, on ungreased cookie sheet. Bake about 15 minutes or until crisp and light brown. Immediately remove from cookie sheet to wire rack; cool. Cool cookie sheet 5 minutes; repeat with remaining slices. Melt semi-sweet chocolate morsels in a glass, microwaveable safe bowl, stirring occasionally with a whisk. Dip biscotti halfway in melted chocolate. Place on a wire rack to dry.